At B2B Heating, we’re proud to offer our customers the best products at competitive prices. And we’ve spent time researching the latest technology as part of our smart thermostat installation service. The Nest Heating Learning 3rd Generation smart thermostat allows you to efficiently manage the temperature of your home from the palm of your hand. Set, monitor and minimise your household’s energy consumption from your smartphone. 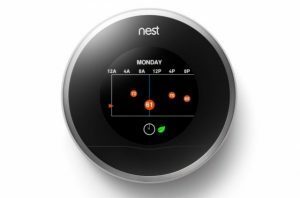 The Nest Heating Learning Thermostat can also adapt to your schedule and programmes itself in response. It uses sensors to monitor when your home is empty, helping keep consumption down by only using energy when you need it. Nest Heating Protect goes beyond what any other smoke alarm can achieve. It can detect fast-burning fires, smouldering fires and carbon monoxide, then alerts you to the specific danger via your phone in case you’re not home. The Nest Heating Protect smoke alarm looks after your family by testing itself over 400 times a day and lets you know everything’s working fine by glowing green once the lights go off. The alarm speaks to you if there’s a problem and your phone is notified when the batteries are low.